Environmental Working Group’s analysis of the 2010 mid-term election results shows that for besieged rural Democrats, their votes for the 2008 Farm Bill and its lavish farm subsidies for the largest and wealthiest farm operations in their districts did not shield them from the Republican wave. There is clear evidence for this with the news that at least 15 Democratic members of the House Agriculture Committee lost their seats, including ardent subsidy defenders Stephanie Herseth Sandlin of South Dakota and Earl Pomeroy of North Dakota. Meanwhile, Democrats who voted against the Farm Bill were largely unscathed. Members of the Agriculture Committee come from districts and states whose economies rely heavily on agriculture, and many of their votes on the House floor are cast with agriculture’s interests -- real or perceived -- in mind. Nowhere is this philosophy more evident than in the Farm Bill, which sends billions of tax dollars back to these districts in the form of direct subsidies to farm producers and wealthy landowners. Conventional wisdom dictates that House members from rural, agricultural areas – and particularly those who sit on the all-important committee – had better support a Farm Bill that maximizes these subsidy payouts or risk losing their seats. As of the last count, 46 seats switched from Democrat to Republican in rural districts that rank in the top half in EWG’s farm subsidy database. In every single one of those races, incumbent Democrats who were in office in 2008 supported the last Farm Bill and the generous subsidy structure that brought billions of dollars home to their districts. Yet their support for the traditional subsidy system did not make enough of an impression on voters to shield them on election day. As expected, Sen. Blanche Lincoln of Arkansas, chairwoman of the powerful Senate Agriculture Committee and a fervent champion of sending federal dollars to large agriculture producers in her state, was also handily defeated in her reelection bid. Even a gambit engineered by outgoing White House Chief of Staff Rahm Emanuel to go around Congress and steer disaster aid to large Arkansas farms failed to boost her reelection prospects. Lincoln’s loss follows past defeats of agriculture-minded Democrats in leadership positions such as former Senate Majority Leader Tom Daschle of South Dakota and Charles Stenholm of Texas, then-ranking member of the House Agriculture Committee, and in the 1992 election, the defeat of Speaker of the House Tom Foley of Washington and Representative Dan Glickman of Kansas. 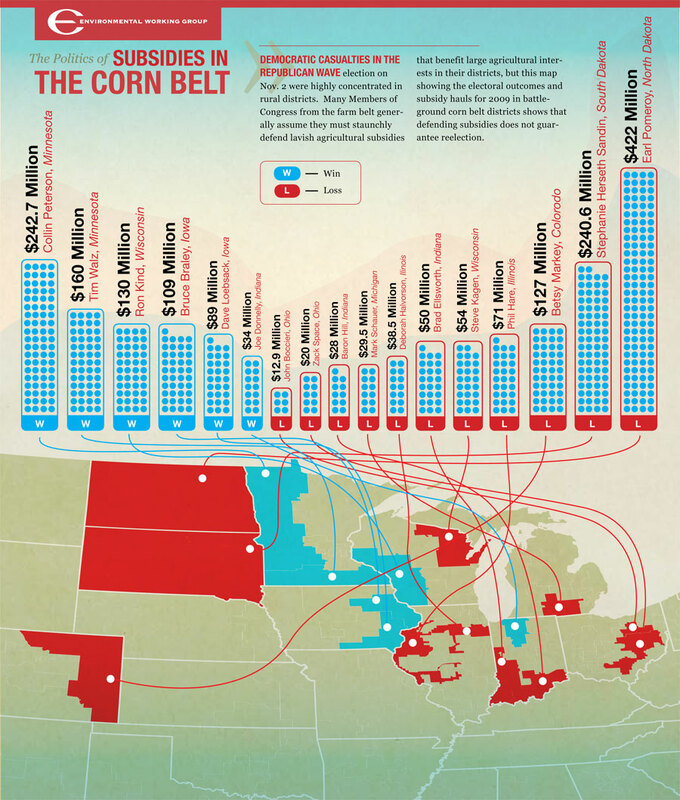 South Dakota consistently ranked near the top in farm subsidies during Daschle’s term in office, and he was a crucial early supporter for expansion of corn ethanol production. Stenholm, after working diligently for decades in support of farm and ranch interests, lost his 2004 reelection bid in part because the Farm Bureau supported his Republican opponent, instead. And Glickman went on to be Secretary of Agriculture under President Clinton. As I wrote on Oct. 11, there is a critical role to be played by the federal government and the taxpayer in supporting farm programs. Small- and medium-sized farmers need a true safety net to protect them from fickle markets and the vagaries of Mother Nature; even large farming operations deserve a measure of support. But the gross inequities in our current maze of farm programs -- sending the bulk of payments to the largest and wealthiest farms and allocating 90 percent of farm subsidies go to just five favored commodity crops – must be changed if America is ever going to realistically confront its simultaneous hunger and obesity epidemics, and find the resources needed to solve agriculture’s many environmental challenges. Tuesday’s results, however, clearly refute the notion that blind service to agribusiness guarantees reelection. If anything, they are a loud signal that there is negligible political benefit to toeing the agribusiness and subsidy lobby line. In fact, the election results from the two election cycles following passage of the 2008 Farm Bill reveal a more complicated picture of a less potent agricultural lobby when elections roll around, or at least one that rarely returns the favor to its most ardent supporters. It’s equally noteworthy that Democrat Ron Kind of Wisconsin, who led the 2008 effort in the House to reform the subsidy system, won his close race Tuesday. Kind’s district ranks 31st overall in receipts of agriculture subsidies ($1.77 billion since 1995). The other Democrat from a heavily agricultural district who voted against the Farm Bill, Rep. Jim Matheson of Utah, also prevailed, winning by five points. Their 2008 reform campaign had the backing of a disparate coalition of groups that included taxpayer, hunger, nutrition and environmental advocates. Five hundred editorials from daily newspapers across America called for reform as well, but the drive was blunted in part by a Democratic House caucus that followed Speaker Nancy Pelosi’s political calculation of embracing the agribusiness agenda. All eyes will now be on the Republicans as they take control of the House. No Republicans from farm country faced serious trouble in Tuesday’s elections, but a look back to 2008 -- when Democrats had a good year aided by a then-popular Barak Obama -- tells a similar story when it comes to farm subsidies. Many of the same Democrats who lost Tuesday came to office by defeating Republicans who supported the status quo Farm Bill of 2008. Then too, that vote provided them with little political cover. Of the 91 Republicans who voted against the 2008 Farm Bill conference report, however, only three members from moderate agricultural districts lost re-election – Virgil Goode of Virginia, whose district ranked 145th in farm subsidies; Steve Chabot of Ohio, ranked 283rd; and Nick Cannon of Utah, ranked 172nd, who lost in a primary. Interestingly, Ohio’s Steve Chabot will be returning to Congress after winning his rematch with Steve Driehaus last night, and in Virginia Virgil Goode’s seat also flipped back to the Republicans with Tom Perriello’s loss. Meanwhile, Republicans from higher-ranking subsidy districts who voted against the 2008 Farm Bill won their races Tuesday. They included Ron Paul of Texas, whose district ranks 37th federal farm subsidy receipts; Mike Pence of Indiana, ranked 43rd; and Todd Tiahrt of Kansas, ranked 54th. These members, along with Kind and Matheson, disprove the conventional wisdom that a vote against the Farm Bill spells political suicide come election season. If members of Congress who vote against the Farm Bill are able to win, and Farm Bill champions tend to lose more often in close races, what does this say about the real political clout of the Big Ag lobby? It would seem that farm state lawmakers need not quake in fear of getting on Big Ag’s bad side, as they did in 2007-08. Speaker Pelosi largely gave in to the agriculture lobby’s demands, prefacing her support for traditional farm subsidies on the need to protect newly elected Democrats who helped deliver her the majority in 2006. Of the 10 or so freshmen Democrats that year, only four remain. One wonders whether her political calculation was worth it in the end. With the potential for new members to replace the defeated Democrats on the House Agriculture Committee, and with specialty crop-friendly Sen. Debbie Stabenow in line to take over the Senate Agriculture Committee, the Democratic caucus has an opportunity to pursue a more progressive course on farm policy – one that will better reflect the nation’s priorities of healthy food, conservation and a fiscally responsible, equitable farm safety net. With the House’s power shift to the GOP, the consensus is that Rep. Frank Lucas of Oklahoma will take the reins from current Agriculture Chairman Collin Peterson of Minnesota. Lucas has made clear that direct payments – billions every year in farm subsidies that go out automatically to the largest farm operations regardless of need – are untouchable. However, with John Boehner poised to take hold of the Speaker’s gavel, EWG’s hope is that he will remember his own “no” vote on the Farm Bill, and that the scores of new Republicans who won yesterday on promises to shrink the size of government will remember those promises when the opportunity arrives to shrink the government dole for big agribusiness. Voters, it seems, will thank them.